Whether you work in marketing or are a business owner trying to increase brand awareness, you’ve likely heard about both inbound and outbound marketing. Maybe you’ve even used their various techniques, whether you realized it or not. But if you want to be as effective as possible, it’s important to know the facts behind any type of marketing you do. 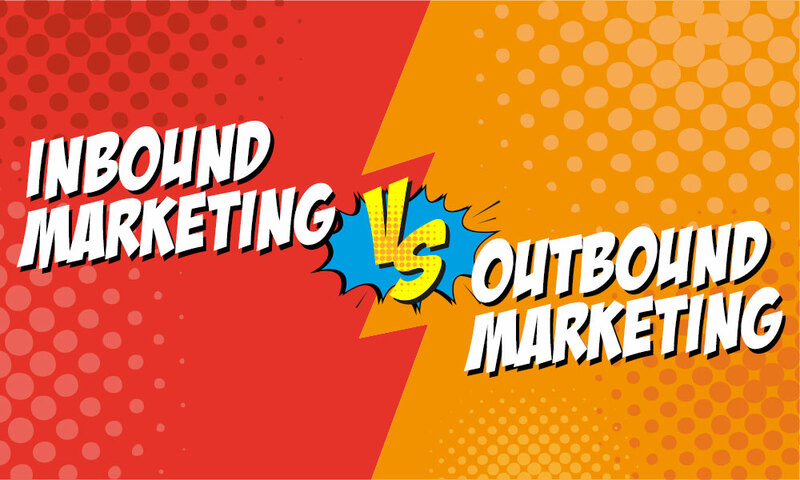 It’s a good idea to get to know the differences between inbound and outbound marketing. More importantly, you should know whether focusing your attention on inbound or outbound marketing makes more sense for your business. In this post we’ll explore the differences between inbound and outbound marketing and whether you should focus on either when marketing your small to mid-sized business. Simply put, outbound marketing is often made up of traditional advertising techniques, while inbound marketing relies on newer methods to reach an audience. 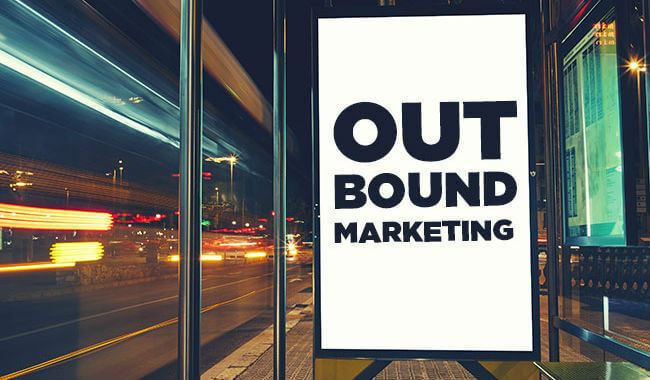 Outbound marketing requires you to actively reach out to people so you can grab their attention and deliver your marketing message. When you directly deliver you marketing message to an audience through some form off communication or advertisement, you’re practicing outbound marketing tactics. Many marketing experts claim outbound marketing is no longer very effective because people get inundated with it so much and can easily tune you out using tools like spam blockers and caller ID. For this reason, marketers now increasingly turn to inbound marketing to get discovered, meaning customers come to them instead of the other way around. Simply having a website, blog or social media page for your brand is a good start to inbound marketing. Is the shift from traditional forms of marketing, or outbound marketing, to more modern techniques, or inbound marketing, really the right choice for small to mid-sized businesses? The goal for your inbound marketing campaign should be to first attract the attention of consumers, and one of the best ways to get started is to have a website so that people can easily find your business online. Adding a blog and the right SEO keywords will help you get found faster, as will being active on your brand’s social media accounts. Once you get people to your website, blog or social media pages, you can turn them into leads using a great call to action. You can also have them fill out a form to get a free whitepaper, report or anything else that might be of value to them. Once you have their contact information, you can send emails or make phone calls, at which point you have a chance to close. Meanwhile, keeping your social media and blog updated with valuable information will keep them interested in your brand throughout the sales cycle. Most businesses have practiced some common outbound marketing techniques when trying to get the attention of their audience. The most popular include direct mail, cold calls, print ads, and banner ads. Placing ads on television, radio, or in newspapers and magazines is also outbound marketing. Other techniques of this kind include billboards, trade shows and seminars. Though many brands still employ these methods, there’s definitely more resistance to them than ever before. People no longer have to watch or listen to ads on the TV or radio because they use streaming apps, and more people than ever before get their news online rather than from the newspaper. It’s common to use ad blockers online and to screen phone calls with caller ID, making it harder to reach your audience when you’re using outbound marketing techniques. Inbound vs. Outbound for Small to Mid-Sized Businesses? We’ve explored how inbound and outbound marketing is approached and the techniques used in both, but which is better for small to mid-sized businesses? The answer is both. The bottom line is that, while the specifics will differ from business to business, small to mid-sized businesses need to be effectively leveraging a healthy mix if inbound and outbound marketing activities. Don’t fall into the trap of assuming that because you’re primarily an online or offline business that your marketing should be limited to online or offline methods only. Not every marketing activity will, or is intended to directly generate leads. While still very important, some marketing activities or techniques will play more of a supporting role in your lead generation efforts. 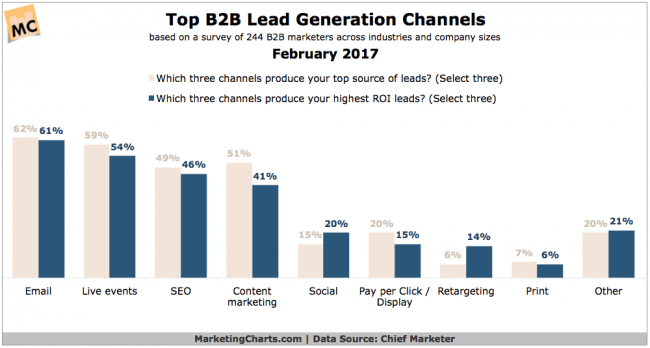 Having said that, even if we look at only the top four lead generating marketing activities, we find that they are split between inbound and outbound marketing activities. When executed properly, your inbound and outbound marketing should work together. It is worth noting that email marketing is a grey area in terms of classifying it as inbound or outbound marketing. Depending on how it is used it can either be a way of directly delivering your marketing message to your target audience, making it outbound marketing, or a way of sharing relevant content that is not a direct marketing message but intended to encourage interaction with your brand, making it inbound marketing. At the end of the day, the terms “inbound marketing” and “outbound marketing” are more of a reflection of the changing marketing industry and our own self-segregation than a paradigm shift in how you should approach marketing your business. Your marketing should begin with your business goals. Once you have established business goals you can decide on marketing objectives that will help you achieve your business goals. Finally, decide which marketing techniques and channels with help your meet your objectives. For most small to mid-sized businesses this will mean both inbound and outbound marketing. The most successful businesses will be those who successfully integrate their marketing across all channels into one cohesive and resonant message. Contact MARION today to get a quote and learn more about how we can help grow your presence in the market, and your bottom line. If you feel that there is a deficit in either your inbound or outbound marketing, partner with an integrated marketing agency who has experience successfully executing marketing activities in that area, or consider working with a firm that offers online marketing services for both your inbound and outbound marketing needs.